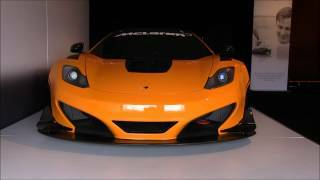 McLaren is planning on unveiling their latest creation that comes from McLaren GT, their new race car division. 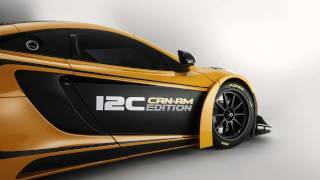 The McLaren 12C Can Am Edition Racing Concept is to be unveiled at the Pebble Beach Concours d’Elegance held this Sunday August 19. Interestingly enough, this is the first time McLaren has unveiled a racing variant outside of Europe. First things first, let's take a look at what beats under the new concept's bonnet. The Can Am is motivated by the same 3.8 liter twin-turbo V8 that can be found in the road-legalMP4-12C but unlike the latter, the engine in the concept is able to develop 630 horsepower instead of the regular 617. Furthermore the racing concept is also 221 lbs. lighter than the road-going 12C, resulting in sharper handling and even sportier characteristics. In terms of design the racing concept differentiates itself from its tamed sibling by quite a lot. From the new paint and livery to the new body kit, you can spot the differences between the two versions a mile away. 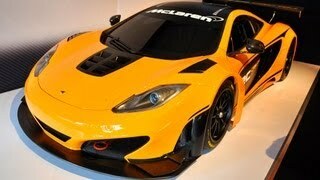 The Concept comes with a bright Orange paint thatMcLaren claims is a tribute to the cars of Denny Hulme and Bruce McLaren. The Orange paint contrasts with the satin black paint job on the car's doors, bumpers and roof. Carbon fiber elements also stick out and further accentuate the sportiness of the concept. In terms of aerodynamics the new race car comes with a pretty large rear wing, a very large front splitter at the front, a new diffuser at the back and various other air intakes carved in the body. The results are pretty astonishing and all these design changes increase the downforce by 30% when compared to the road-going model. On the interior, the Can Am has been fitted with a new steering wheel that has been inspired by the MP4-24 Formula 1 car driven by Lewis Hamilton, a rollcage and two racing seats featuring six-point harness. Despite the fact that the interior looks pretty much like any other racing car, the air conditioning system is not missing. The reason behind this is that many competitions, especially the ones like Le Mans have changed their regulations and air conditioning is now mandatory in order to keep the driver cool. In case you're a car enthusiast, you don't have anything planned for the weekend and you reside near Pebble Beach California then consider attending the Concours d’Elegance. Tickets are $200 in advance or $250 if you'll buy them on Sunday.